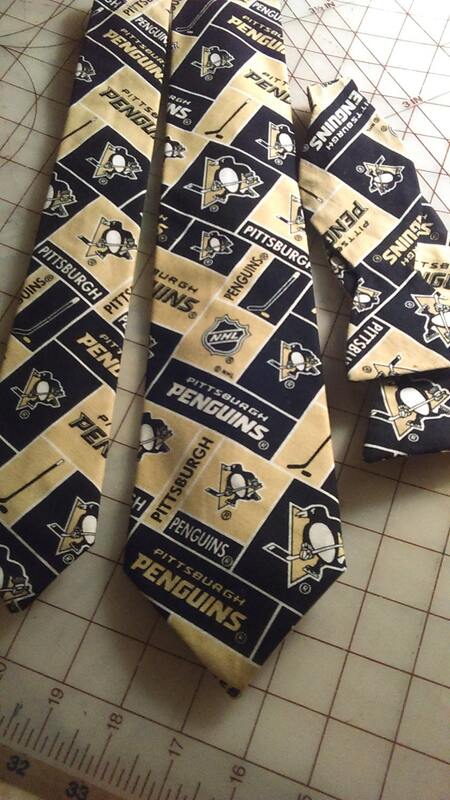 Pittsburgh Penguins Necktie in bow tie, skinny tie, or standard tie styles, and kids or adult sizes. Great for any fan. Adult bow tie is self-tie, sized to 16.5", custom length available at no charge. Kids’ bow tie comes pre-tied, and has back elastic to allow it to slip over the head. Please see chart below for full necktie and bow tie sizing for children and adults. I tried contacting the merchant and it’s been two days past the 6 business days and still have not received my order. I really don’t know if the merchant shipped the item two days before it was due or what? Still no response and nothing in the mail. I am very disappointed. I will not be ordering from here or this website again. This is terrible. The material is nothing more than a team flag and as thin as paper. The only stitching for the tie is on the back for the tie keeper loop. No stitching anywhere else - it is just ironed into a necktie shape. No know can be made around your neck with this tie - it cannot be worn.